Habitat ReStore - Times Publishing Newspapers, Inc.
ReStores are home improvement and donation centers that sell new and gently used furniture, cabinets, appliances, building supplies, home décor, electronics, and so much more at a fraction of retail value. They offer free donation pick-ups throughout Bucks County (call 215-822-2708), or you can drop off donations during business hours at their stores (no appointment needed); all donations are tax-deductible. “Right now is the best time to call us to schedule a donation before the spring and summer rush is upon us,” says B.J. Breish, ReStore Director. While the primary source of product donations are from households throughout our local communities, ReStores also partner with corporations wanting to find alternatives to landfills or other costly options and are genuinely looking for a way to support their local community. In 2017 the Bucks County ReStores diverted 2,450,000 pounds of material from landfills from the sales of their donated goods, and various recycling initiatives, they offered opportunities for student and adult volunteers, they catered their environment to support individuals with special needs so that they gained valuable work experience and life skills, partnered with area schools’ various work-study programs, and help clients from the local social service agencies in need of free or greatly discounted necessities. Unlike other thrift stores, ReStores are reliant on volunteers. Volunteers from major corporations and local businesses offer their time to the ReStore and also hold donation drives, but the day to day volunteers are your neighbors and friends offering as much time as they are able and trying to support their community. 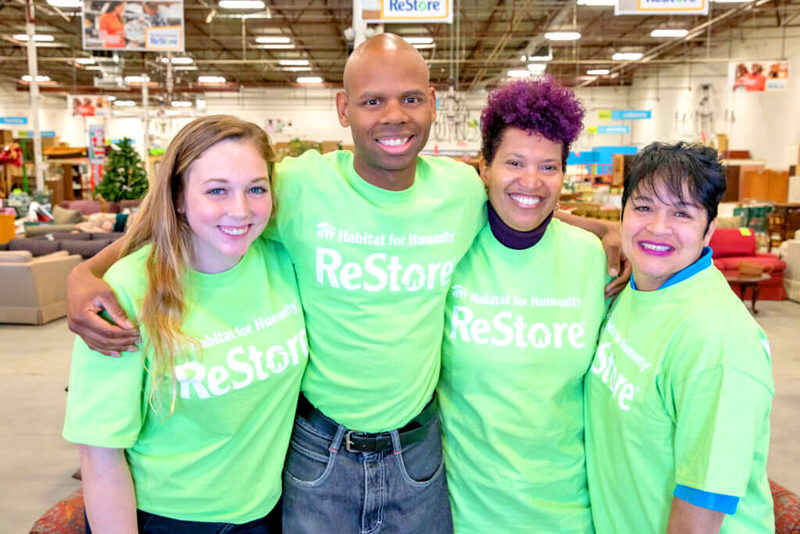 If you are encouraged to join, visit Habitatbucks.org, give them a call at 215-822-2812, or better yet check out the ReStore nearest you! For corporate partnerships or to inquire on behalf of their Social Service initiatives contact B.J. Breish 215-822-2812 x 305 BJ.Breish@habitatbucks.org. To schedule donations call 215-822-2708 or e-mail Dispatcher@habitatbucks.org. To volunteer call 215-822-2812 or Volunteer@habitatbucks.org. PHOTO CAP: Every hand makes a difference. 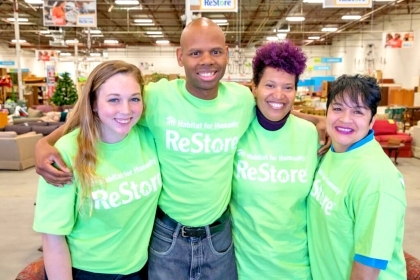 Join the ReStore volunteer team.